The Sweet Spot: Shout out to my Peeps! 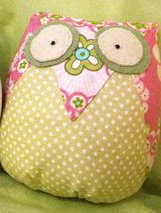 Check out this adorable owl from flutterbysandflowers. And what's the deal with owls and birds? SO stinkin' cute! I'm loving the throwback to all things retro.